Want to bring business travelers to your hotel — and keep them coming back? 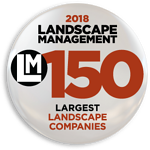 Offer them creative, luxurious landscaping features they can’t resist. Raleigh area hotels are really focusing on the weekday traveler, Smith says. “When you’re traveling for work, you want a nice extended office space,” he says. “You want to be poolside working, or sitting at a coffee cafe. Here’s how to lure — and keep — those valuable guests. Your chance to impress begins when your guest first pulls into the parking lot and approaches your entrance, Smith says. Does the landscaping pack a punch with well-tended colorful flowers and oversized pots of exotic tropical plants? Intrigue your hotel guests from minute one, Smith says. Sure, you’ll have more opportunities later, but nothing replaces that crucial first impression. “Hotels want constant color,” Smith says. “That means a rotation of colorful annuals, so you have color blooming no matter the season. “Hotels want color more than they want perennials or shrubs,” he says. Add sweeping expanses of lush green turf for that luxury feel. A fire pit? At a hotel? A Triangle area Marriott hotel recently had one installed just outside the lobby. “It’s propane, so you just flip a switch,” he says. “A husband and wife can come back after a long day, have a cocktail, lounge by the fire pit and be in for the night,” he says. The hotel invested big in its new outdoor courtyard, Smith says, with lush, crisp lawn and lots of room for bistro tables. “Hotels are looking to keep their guests there at the hotel,” Smith says. Starbucks on site. Pools. Cabanas. Hammocks. (They’re a huge trend now.) Coffee cafes. “You always have work when you’re traveling,” Smith says. “You have your regular work, plus the work you came there to do. 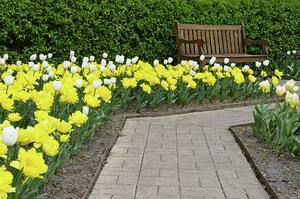 That means landscaping for hotels should include plenty of inviting spots to relax and put your feet up. Tropical-inspired courtyards. Poolside bars. Intimate cafes. Don’t forget the power of plants to soothe workday nerves, from lush expanses of green grass to huge pots of tropical blooms that offer a vacation vibe. One of his clients recently tore out their water feature and replaced it with landscaped beds. If you want that soothing sound of water, he says, opt for a pondless water feature. No muss, no fuss. Don’t forget the importance of landscape lighting in offering the perfect ambiance at your outdoor bistro, cafe or poolside bar. Strings of festive bistro lights add an instant “get-away-from-it-all” feel. Battery-powered table lamps offer intimacy. Adding a fire pit? Don’t forget path lighting to get guests safely there and back. Lush green lawns. 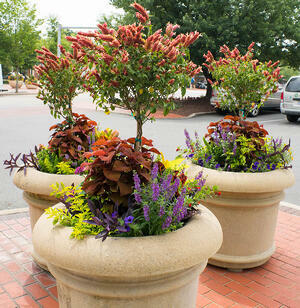 Impressive planters filled with colorful seasonal blooms. Fire pits. On-site everything. 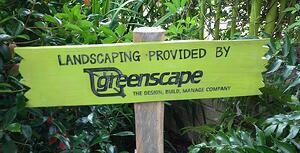 At Greenscape Inc. we know how crucial it is to attract great hotel customers — and keep them coming back. Hotel landscaping can make all the difference.